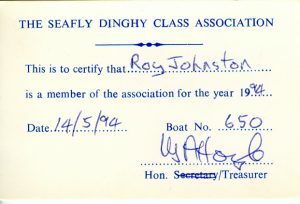 The UK Seafly Dinghy Class Association (SDCA) was formed when a few enthusiasts met at the invitation of Derek Anstead at his home in Topsham, Devon, on 18th November, 1961. 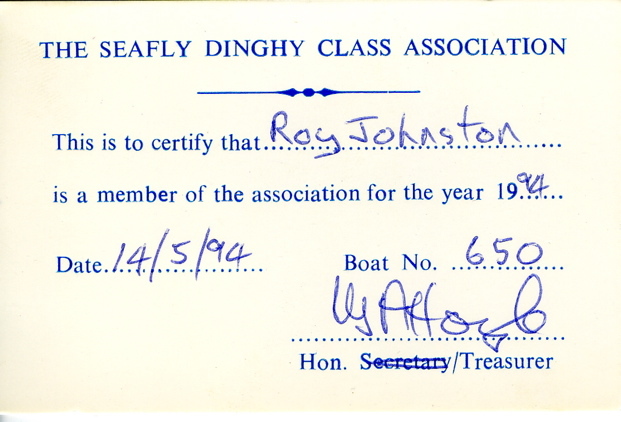 Rules were prepared and submitted for the approval of the RYA, and the SDCA was officially recognised by the R.Y.A. in 1963. ” Class ” racing commenced in 1962 and the first National Championships were held under the burgee of the Royal Western Yacht Club of England in Plymouth Sound during July, 1963. 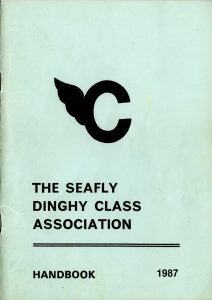 The main aims of the SDCA were to promote Seafly sailing, to maintain the one design character of the class, to maintain a register of owners and boats including issuing measurement certificates, to support an annual National Championship and other race meetings, and to encourage the formation of “Seafly Fleets” and Class Association Branches. The full SDCA Constitution (as in 1987) appears on pages 5 to 10 of the that years SDCA Handbook. The 1971 SDCA Handbook listed overseas locations where Seafly sailing was taking place as Canada, Australia, New Guinea, Malta, and Sardinia. An active Class Associations existed in Australia and, less formally, in Canada. These will be described in separate pages.